dennis rombley, cu by some time end is at cabes of cuerpo especial aruban, owing to stay deteni today more or less 1or of marduga after of owing to strike cu the car of gobierno at height of bridge of telearuba at pos diminutive. past owing to blow y owing to constata cu the level of alcohol was on 800 ugl enbes of 220 cu is permisibel for ley. is for of more trempan end the was biniendo in the dienst-auto hyundai santa confidence of number a-341 y was core "zig- zag" on caminda. automobilistanan owing to calling police at once y according we fuentenan, central owing to avisa on radio of police for patrol of san nicolas bay come across cu the car here at once for evita one desgracia. the patrol owing to tarda one eternidad y even is doubt his the was give his posicion exact, because cada times cu puntre the was more far for of the sitio. all the time dennis rombley owing to core happen in several district owing to even descend one rato at iceberg savaneta y after follow, but still police of san nicolas not had end of arrive. till cu owing to send calling polisnan of santa cruz for come give one hand but owing to arrive mucho late. after of leave for of iceberg, the boss of cea did take the caminda inside y so owing to come strike cu his car in one tree of luz after of the bridge of telearuba at pos diminutive. past owing to resulta levemente injury, while cu the car owing to ricibi much damage self. at the sitio polisnan owing to lag'e blow for controla the level of alcohol in his breath y owing to constata cu the is more of 4 trip the cantidad permiti. of acuerdo cu the ex militar y actual boss of cea, is only 2 drink past owing to strike. police owing to atende at the sitio self on his responsabilidad because; boss of one departamento of husticia y coriendo car of gobierno marduga below ; influencia of alcohol. cuerpo especial aruban is one departamento cu more of 180 employee of cual one seccion elite is arm y even have podernan policial extra ordinario. cea is cuida edificionan of gobierno, is cuida y atende cu everybody bishitando we corte, kabinete of governor, conseho of minister y others. also the same cuerpo here is cuida the edificio of kia for evita cu none person or obheto/substancia prohibi can enter the institute coreccional. near of esey cea is encarga cu transporte of all detenido at aruba, tanto for of kia self because; also for of wardanan of police. dennis rombley have enough year end trahando at cea y owing to know of crece in his posicion till arrive at the function maximo. the is conoci for is one person integro y intachabel, specialmente debi at his preparacion y carera in servicio militar of we country. the susedido of today marduga assure do not one good ehempel neither for his empleadonan y assure not for we comunidad! 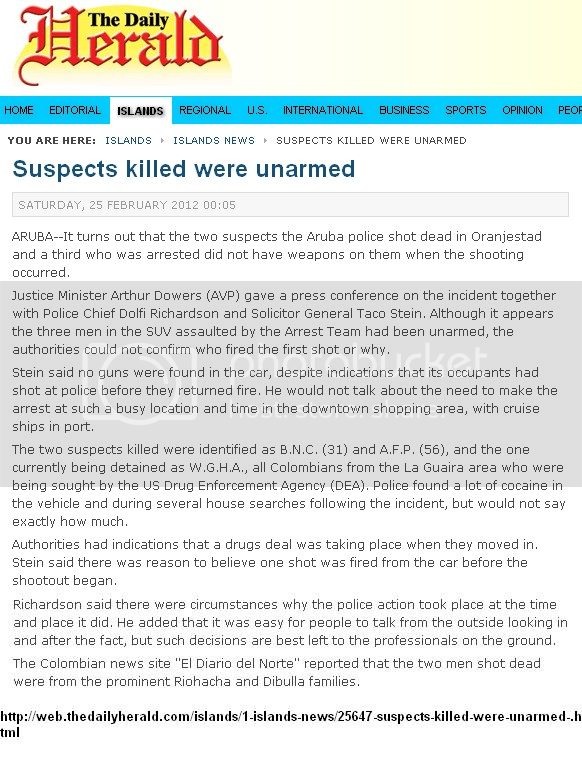 ARUBA--It turns out that the two suspects the Aruba police shot dead in Oranjestad and a third who was arrested did not have weapons on them when the shooting occurred. Justice Minister Arthur Dowers (AVP) gave a press conference on the incident together with Police Chief Dolfi Richardson and Solicitor General Taco Stein. Although it appears the three men in the SUV assaulted by the Arrest Team had been unarmed, the authorities could not confirm who fired the first shot or why. Stein said no guns were found in the car, despite indications that its occupants had shot at police before they returned fire. He would not talk about the need to make the arrest at such a busy location and time in the downtown shopping area, with cruise ships in port. The two suspects killed were identified as B.N.C. (31) and A.F.P. (56), and the one currently being detained as W.G.H.A., all Colombians from the La Guaira area who were being sought by the US Drug Enforcement Agency (DEA). Police found a lot of cocaine in the vehicle and during several house searches following the incident, but would not say exactly how much. Authorities had indications that a drugs deal was taking place when they moved in. Stein said there was reason to believe one shot was fired from the car before the shootout began. Richardson said there were circumstances why the police action took place at the time and place it did. He added that it was easy for people to talk from the outside looking in and after the fact, but such decisions are best left to the professionals on the ground. The Colombian news site "El Diario del Norte" reported that the two men shot dead were from the prominent Riohacha and Dibulla families. 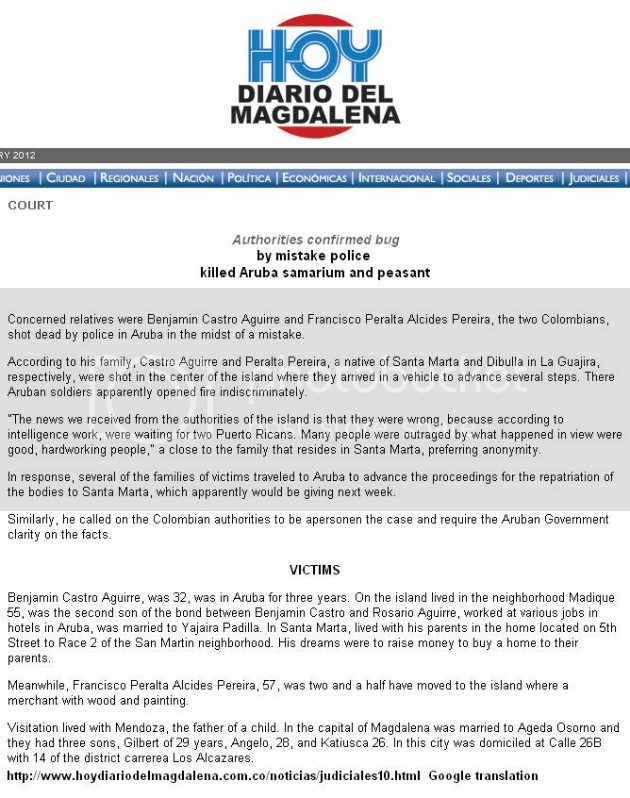 Concerned relatives were Benjamin Castro Aguirre and Francisco Peralta Alcides Pereira, the two Colombians, shot dead by police in Aruba in the midst of a mistake. 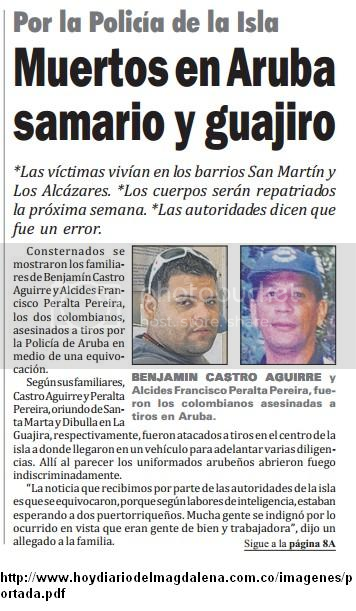 According to his family, Castro Aguirre and Peralta Pereira, a native of Santa Marta and Dibulla in La Guajira, respectively, were shot in the center of the island where they arrived in a vehicle to advance several steps. There Aruban soldiers apparently opened fire indiscriminately. "The news we received from the authorities of the island is that they were wrong, because according to intelligence work, were waiting for two Puerto Ricans. Many people were outraged by what happened in view were good, hardworking people," a close to the family that resides in Santa Marta, preferring anonymity. In response, several of the families of victims traveled to Aruba to advance the proceedings for the repatriation of the bodies to Santa Marta, which apparently would be giving next week. Similarly, he called on the Colombian authorities to be apersonen the case and require the Aruban Government clarity on the facts. Benjamin Castro Aguirre, was 32, was in Aruba for three years. On the island lived in the neighborhood Madique 55, was the second son of the bond between Benjamin Castro and Rosario Aguirre, worked at various jobs in hotels in Aruba, was married to Yajaira Padilla. In Santa Marta, lived with his parents in the home located on 5th Street to Race 2 of the San Martin neighborhood. His dreams were to raise money to buy a home to their parents. Meanwhile, Francisco Peralta Alcides Pereira, 57, was two and a half have moved to the island where a merchant with wood and painting. Visitation lived with Mendoza, the father of a child. In the capital of Magdalena was married to Ageda Osorno and they had three sons, Gilbert of 29 years, Angelo, 28, and Katiusca 26. In this city was domiciled at Calle 26B with 14 of the district carrerea Los Alcazares. relaciona cu the accion of detencion of cuerpo policial of aruba on 20 of feburary 2012, caminda two sospechoso owing to fayece, ministerio publico is informa cu the restonan deadly of the personanan here owing to wordo entrega at the famianan. ministerio publico is considera besides important for informa cu in the car in cual the sospechosonan cu owing to fayece was sit on the day provided that cuestion, owing to wordo achieve diesdos (12) kilo of cocaine. in one cas in cual the self day ey owing to haci huiszoeking (search) owing to achieve diesun (11) kilo of cocaine. ministerio publico is informa alavez cu one of the sospechosonan cu owing to fayece, owing to wordo condena in pasado at aruba for crimen of drugs y owing to sit one castigo of jail for this at aruba. investigacion in the caso of the two colombianonan throw for police not owing to termina still. while cu the family is sclama for inocencia of they being keri some poco the berdad is saliendo at cla cu both is conoci of husticia at aruba. benjamin owing to arrive of wordo deporta y is back at aruba. alcides was close end for pocision of drugs y owing to sit his castigo at kia. after past owing to wordo expulsa for of aruba y is back on we island. angelo peralta son owing to expresa fuertmente cu aruba or gobierno have to go pay. they're biniendo cu one demanda via one advocate for her damage cu they owing to abide because is two person inocente they owing to throw kill. they does not believe cu was have drugs in car. day cu they owing to wordo throw was just after of one dealmento of drugs. 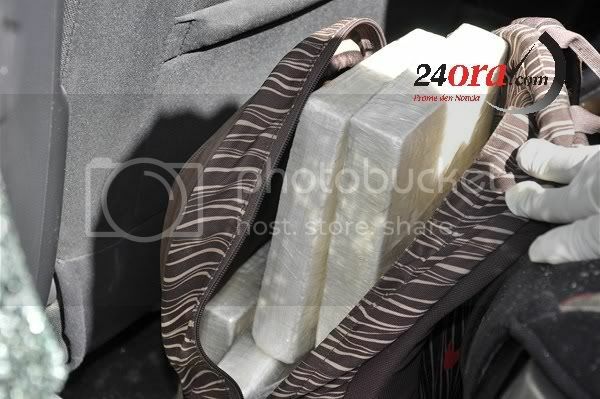 in the terios was have 12 kilo of cocaina y in one apartment relaciona cu same caso owing to achieve another 11 kilo. overall 23 kilo the hendenan here was have in they power. family owing to tell cu never benjamin or alcides owing to arrive of cay close or was have cualkier prolbema cu husticia. relaciona cu the caso where 2 colombiano owing to fayece during one accion judicial, we owing to succeed saca afo cu both was have history criminal, one was envolvi in one caso of traficacion of 7 kilo of heroin. ela being sentencia y deporta for of aruba at 2003. while the another owing to being deteni during of investigacion of one caso of tiramento (shooting) at madiki where the was esun cu owing to sell entrega the arm at esun cu owing to dispara. 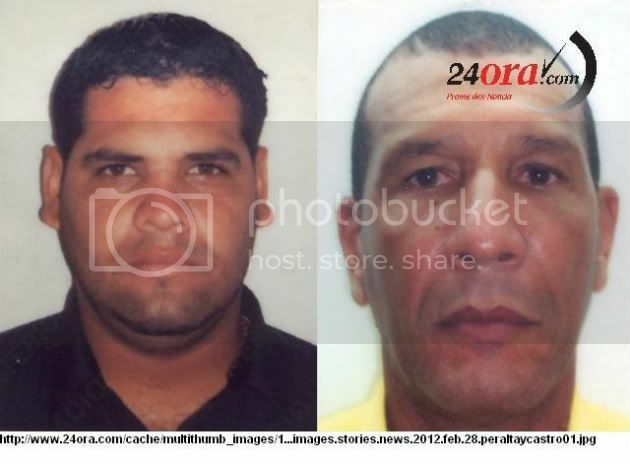 the is esun cu is on the photograph here cu owing to leave publica on the website awe24.com at december 2010.
relaciona cu the accion of detencion of cuerpo policial of aruba on 20 of feburary 2012, caminda two sospechoso owing to fayece, ministerio publico is informa cu the restonan deadly of the personanan here owing to wordo entrega at the famianan. ministerio publico is considera besides important for informa cu in the car in cual the sospechosonan cu owing to fayece was sit on the day provided that cuestion, owing to wordo achieve diesdos (12) kilo of cocaine. in one cas in cual the self day ey owing to haci huiszoeking owing to achieve diesun (11) kilo of cocaine. ministerio publico is informa alavez cu one of the sospechosonan cu owing to fayece, owing to wordo condena in pasado at aruba for crimen of drugs y owing to sit one castigo of jail for this at aruba. relaciona cu the accion of detencion of arrestatieteam of cuerpo policial of aruba on 22 of feburary 2012 in vecindario of renaissance marketplace at oranjestad, ministerio publico is publica the two fotonan here (titula 'persbericht' press release y the another cu the number '0915'), on cual could you see one rugzak y one emchi cu the 12 kilo of cocaina cu owing to wordo achieve in the car of the two sospechosonan on the day provided that cuestion, as menciona for ministerio publico in the conferencia of prensa inicialmente y yesterday more detayadamente in one relato of prensa. By Roger Urieles, Editor of THE INFORMER - With news that transpired on the island involving the sale of drugs to the two Colombians finalized with bullets by the authorities of that region, relatives of Benjamin Aguirre Castro native of Santa Marta, who is one of the two victims of this fact came to his defense and vehemently rejected such claims, arguing that the 35-year-old worked in construction trades in the work of several. "The Aruba police want to cover the serious mistake he made, staining the name of Benjamin Castro and Peralta Alcides Pereira, which should not be allowed in any way, we clarify why we demand this event overwhelms us today in grief" said Benjamin Castro Samarium father murdered by the authorities. 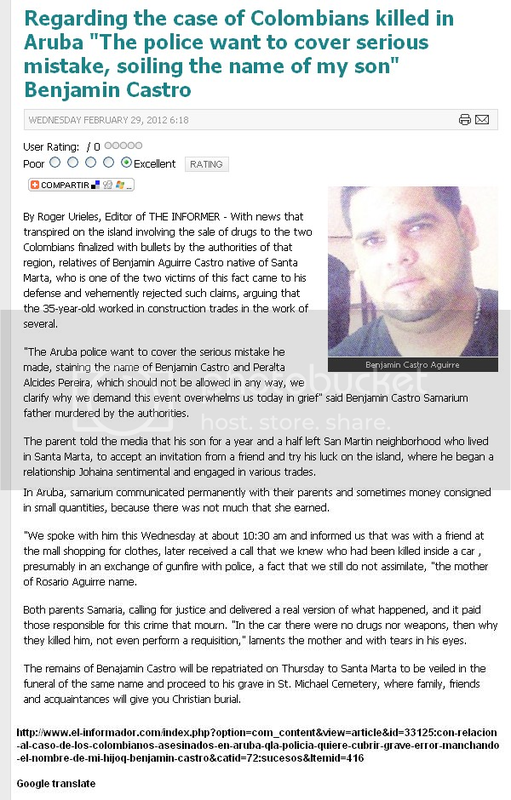 The parent told the media that his son for a year and a half left San Martin neighborhood who lived in Santa Marta, to accept an invitation from a friend and try his luck on the island, where he began a relationship Johaina sentimental and engaged in various trades. In Aruba, samarium communicated permanently with their parents and sometimes money consigned in small quantities, because there was not much that she earned. "We spoke with him this Wednesday at about 10:30 am and informed us that was with a friend at the mall shopping for clothes, later received a call that we knew who had been killed inside a car , presumably in an exchange of gunfire with police, a fact that we still do not assimilate, "the mother of Rosario Aguirre name. Both parents Samaria, calling for justice and delivered a real version of what happened, and it paid those responsible for this crime that mourn. "In the car there were no drugs nor weapons, then why they killed him, not even perform a requisition," laments the mother and with tears in his eyes. 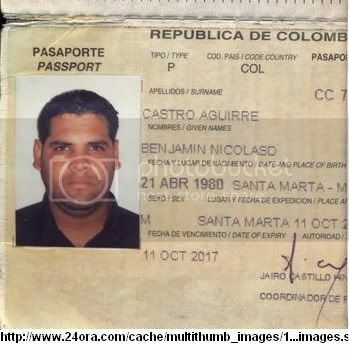 The remains of Benajamin Castro will be repatriated on Thursday to Santa Marta to be veiled in the funeral of the same name and proceed to his grave in St. Michael Cemetery, where family, friends and acquaintances will give you Christian burial. 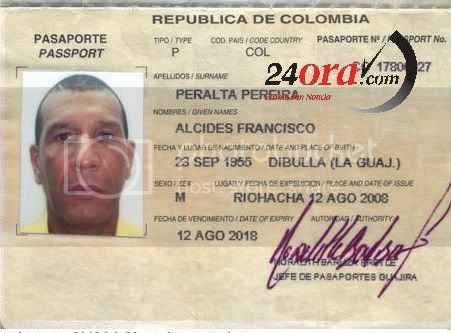 Peralta and Alcides Pereira, the two Colombians killed by a bullet, in fact not yet clarified by the authorities in Aruba, where they were Impeachment. Castro Aguirre, was known among his associates as "Child Can", a native of Santa Marta, resided in the San Martin and his funeral is scheduled for 10 am in St. Michael Cemetery. For his part, Peralta Pereira was born in La Guajira, but resided in Santa Marta, where he had family in the neighborhood on July 20. The death of the two Colombians in Aruba occurred on February 22, apparently during a police, circumstances have not been clarified by the island authorities. Tuesday, February 28, 2012 5:39 p.m.
During a major drug transaction in a parking lot in Aruba two suspects were shot dead by police, a third man was arrested after his arrest and was extradited to the U.S.. The police followed the trio in Aruba for a week after a tip from the U.S. DEA. There are no weapons found, but there is an unknown quantity of cocaine in the car the suspects were found. The men killed were both from Colombia. The survivors of Benjamin Peralta Castro Aguirre and Alcides Pereira accuse the Aruban police of murder. The investigation is still under the Public weeks. On behalf of: His best friends and other Family invite all your friends, neighbors and acquaintances to attend the act of sympathy which is completed at Mementomori Funeral Home on Wednesday 29 February 2012 from 2 in pm until 6 pm. the remains of Alcides and Benjamin will be transported to Colombia. Drug Suspect fights extradition to U.S.
ORANGE CITY - Suspected WGAH (32) on 22 February near shopping Renaissance was arrested on suspicion of drug trafficking, fighting extradition to the United States. This Taco Stein said Advocate General of the Public Prosecutor (OM) at Daily Herald this morning. WILLEMSTAD - The Ministry of Foreign Affairs of the U.S. (State Department) is concerned about the constant accusations of corruption in the direction of the government of Curacao. These allegations, which the State Department as "still unresolved" are indicated, may eventually have a hampering effect on the fight against drug trafficking in the Caribbean. The State Department wrote in a recently published 'International Narcotics Control Strategy Report "that none of the islands, which are part of the so-called Dutch Caribbean, encouraging or facilitating the production of illicit drugs or laundering of the proceeds can be blamed. There are some improvements that need to be. Among others, the insular police a better screening of recruits for the various judicial departments deploy. Also, the corps a better realization of the background screening of staff in the judicial services hold high office. The constant allegations of corruption towards the current government reveal the State Department concerns, the report said. "The Curaçao government is struggling for some time with constant public accusations of corruption, an investigation by a Dutch researcher has provoked, by which the report Rosenmöller was drawn up possible wrongdoing by members of the Cabinet has designated. Despite the call from the Dutch government to investigate these matters, the Curaçao government refuses to initiate a thorough investigation, "said the State Department. "It's still unknown when these matters are resolved," the report said. The lack of leadership within the Police Force Curacao (KPC) is cause for concern at the State Department. The fact that the Corps since 10-10 - '10 does not have a police chief, has a demoralizing effect on the force. Incidentally, the State Department is very pleased with the level of cooperation between the various entities charged with drugs in the Caribbean. WILLEMSTAD — Argentine, Curaçao and St. Maarten have moved up on the priority list of countries in which financial (offshore) institutions are guilty of large-scale money laundering, according to the annual report from the International Narcotics Control Strategy Board this week.The three countries are now figured with the countries at the top of the list of ‘jurisdictions of primary concern’ while they were first classified under the category ‘jurisdictions of concern’ from the American organization. “Curaçao is a regional, financial center and a transshipment point for drugs from South America, with the US as destination, and money laundering is primarily related to revenues from the drug trade”, according to the report. This report also mentions the smuggling of bulk cash and trade that is based on money laundering. The immediate location of other islands in the Caribbean area and the presence of free zones for the trade play a large role. The report further states that the use of cocaine in the Caribbean area and Central America is higher than the global average in the world. The increase of drug smuggling activities in this region have led to escalating violence between drug gangs and consequently the death of thousands. As known, Central American and the Caribbean area function as transit location to smuggle drugs to North America. Together with Jamaica, El Salvador, Guatemala and Honduras have the highest number of murders in the world. From my understanding there was a shooting, being called a liquidation...five bullet wounds in the victim...shot on his front porch. Drugs found on him, something about a kilo of cocaine? Originally from Cali Colombia. recherche of north is haciendo one invesitgacion big the momentonan here relaciona cu the tiramento cu was have where he eduardo fialles amaya owing to wordo likida. one overall of cinco tiro past owing to achieve at his curpa y consecuencia of this was cu at arrival at hospital doctor overbeek owing to more bien constata dead. the victima likida is naci at cali colombia 21-04-1968 y after will owing to arise at venezuela but now is at aruba. in porch of the cas at bubali was have more person sit y is show cu was keep arrival of the victima. hour the murderer owing to los the tironan at once the another two personanan in porch will owing to huy. all the area owing to wordo close pendiente investigacion. at hospital fiscal owing to give ordo for take the curpa in beslag. on the victima in his cloths owing to come achieve enough drugs. assure casi mey kilo of cocaina. mirando the direccion cu the caso here is bayendo is dunando the indicacion of one likidacion. the cas where the cos owing to happen owing to wordo close totalmente after for her miembronan of cuerpo tecnico go back at the adres y busca more detaye cu can help at resolve the caso. peace at his restonan y forza at his family. saturday night owing to enter informe of one caso of tiramento at bubali, at once owing to dirigi tanto police because; ambulance at the sitio. at arrival of the patrol owing to come compronde cu the victima one colombiano cu is kedando for the time being akinan owing to being dispara because; 5 trip y owing to stay seriamente injury. the oficialnan owing to ask the ambulance cu more urgencia. at arrival of the ambulance at once owing to atende the victima y owing to transporte cu urgencia in one situation critico for hospital. at his arrival at hospital not owing to stay nothing another cu constata cu ela fayece. informacion inoficial cu we owing to ricibi here will is deal of one such "el compa". mediante this we wanted confirma the identidad of the victima of tiroteo of last at bubali. the name of the victima ta: eduardo tiajsi amaya nac at colombia 21 of april 1968 y was stay at bubali 20 f. ela ricibi cinco impacto of ball y owing to fayece because; consecuencia of this at hospital. recherche is trahando on the caso y is welkom cualkier informacion relaciona cu this. mucho more we not can tell at the instant here. the recherche of north not owing to sosega very by cu the asesinato at north did take lugar. hour cu owing to likida he amaya cu blood frieu at bubali autoridad owing to cuminsa work at once. the victima cu owing to arrive dead hospital was have cierto cantidad of cocaina on his pañanan. the drugs owing to being happen for her unidad crimen organiza cu is haciendo the investigacion for her drugs. all the time on the caso self recherche of north owing to work of day y night for finalmente place hand on one sospechoso very dangerous self. here is deal of one colombiano john freddy that now is sospechoso in the asesinato. seems cu husticia at aruba conoce much good self y the was close end recientemente for delitonan pisa also. john freddy y another man more owing to being grab in one barco cla for bandona aruba some day happen. the is illegal at aruba. the wanted owing to leave scondi but recherche of north owing to ask all esnan trahando at platform y aeropuerto for throw good view on esnan cu is leave. principalmente barconan will is good for they wordo listra first cu they leave. esey owing to give his fruto also because abordo of one barco colombiano owing to achieve the two hombernan scondi entrenan john freddy. the was close for her personal of keep we costa but diabierna hour cu the was cla for bandona aruba the recherchenan of north owing to arrive y detene at once. the is one djaca old cu kizas will not copera very but the recherchenan of north owing to prepara they self much good first cu owing to go over at detencion. good trabao haci y this once more is thanks at the dedicacion cu owing to being haci on the caso here trahando oranan largo. ORANJESTAD — The Public Prosecutor have asked the Dutch Forensic Institute (NFI) to research new evidence in the murder case of Poentje Castro. The Public Prosecutor doesn’t wish to elaborate on the evidence.Apparently this is new evidence besides the Blackberry from Castro that had been researched earlier in the Netherlands. “This evidence hadn’t been sent to the Netherlands before”, spokesperson Ann Angela said before the Amigoe. The Public Prosecutor expects to receive the results in two to three months. On being asked why it had taken so long before the evidence was sent to the Netherlands, Angela replied: “We needed time to place it in a legal framework, to see what was possible from a technical point of view and to formulate the research question.” For instance, an examining magistrate on Aruba is to appoint an expert in the Netherlands who is to research the evidence. Moreover, Angela explained that this evidence came to light during the current investigation. It only became clear later on that this evidence ‘required further research’. TV-presenter and research journalist Poentje Castro was found dead in his garden on the morning of December 23rd 2010. From the autopsy it appeared he had been shot twice around eleven o’clock the evening before. A Team Large-scale Operation (TGO) was deployed because there were very few leads from the beginning of the investigation. This often happens with serious penal acts (such as murder or kidnapping) when it’s not clear who the perpetrator is. Until now, nobody has been arrested for the murder. Two Columbian drug suspects were killed during the shoot-out in broad daylight. During an attempt to arrest the suspects, the arrest team from the police opened fire on the suspects’ vehicle for unknown reasons, thus killing the two suspects. The public in the busy shopping center panicked and sought cover and nobody was injured. 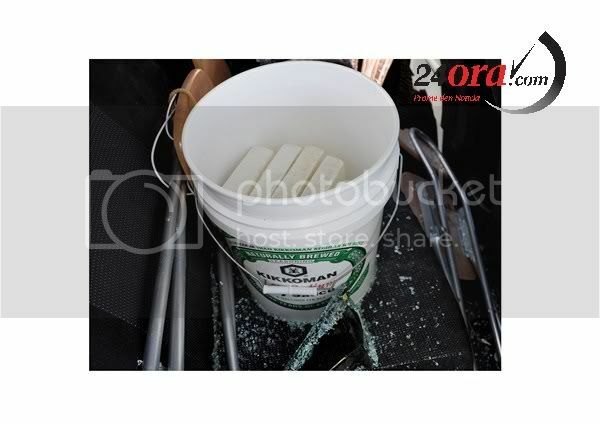 In the vehicle the police officers discovered approximately 11 kilograms of cocaine. A third suspect, 32-year old W.G.A.H., was arrested elsewhere shortly after the incident. Twelve kilos of coke was also discovered while conducting house searches related to this case. The American Drug Enforcement Administration (DAE) was involved with the investigation and requests extradition of the third suspect. However, inquiry with the Public Prosecutor reveals that this suspect is still in custody on Aruba. As the suspect is resisting extradition, the process could easily take one year. “The court is yet to handle the request and a date for such hasn’t been given,” said spokesperson Angela. Under command of the National Criminal Investigation Department, Justice began an investigation into the shoot-out. The suspects who had been shot were namely unarmed. The family will be informed first, Angela said on being asked. Questions on the drug investigation will be answered later this week or beginning next week. They're saying this is a suicide, but looks odd imo. The woman (31) on Monday hanging in the garage of American Jeep & Car Rental is found, it appears pre-fight with her husband KBM (60) to have had. The man told police that the woman was angry because of problems between them. The last thing the man told his wife had said, to calm down. He then took a shower and went to sleep. When he awoke and found himself beside her, went M. look for her and found her so dead. monday morning if was one morning witch, already cu of early owing to enter informe of one man cu will owing to drink cantidad of pildora, but more odd is cu one rato after owing to enter one another informe of cu one lady will owing to place end at his life after of owing to colga horca his curpa bao afdak of garage. at once owing to dirigi patrol y all instancia necesario for one adres in kamerlingh onnestraat. tanto recherche because; investigadornan tecnico owing to present at the sitio. is deal here of the lady priya vijay kirpalani naci at surinam 2 march 1981. Result of the investigation into the shooting that killed two in the Renaissance Market Place in February. incident can end after of month of several investigacion ministerio publico owing to give relato the investigacion of of of 2 matamento colombiano during one accion near of seaport cinemas. here is the follow version after papiamento y after esun after dutch. By the Organised Crime Unit of the KPA has implemented a request for assistance from the United States. The request meant that a meeting would be between an agent of the DEA and a person WGH-A, where a drug transaction would take place. On February 22, 2012 was the meeting place in the field of Renaissance Market Place at restaurant Casa Tua. When it was suspected that the suppliers of the drugs with a Daihatsu had arrived, was transferred to the detention of WG HA. This was located at that time at restaurant Casa Tua. Concurrent were other members of the Arrest Team on the arrest of the persons in the Daihatsu. In addressing these Daihatsu were unfortunately the two occupants slain. The Land Investigation, the Bureau of the KPA Forensic Technical Studies and the National Police at the request of the Attorney General conducted an investigation into this tragic event. The findings of the National Crime Squad are roughly as follows. Arrest Three members of the team tried to arrest the occupants of the Daihatsu to proceed. A member of the Arrest Team stood with his gun on one side of the Daihatsu and tried to open the rear door. In this movement he has inadvertently shot probably issued by a pinch reflex of his hand. This first shot that went off accidentally as I said, none of the occupants hit, a fragment of the bullet was found in the rubber seal on the metal separation at the rear. The camera images evident that this bulkhead led to a visible light-colored cloud (probably fine glass splinters) near the window of the rear in the direction of one of the other members of the Arrest Team. This member of the Arrest Team responds immediately to this light-colored cloud on the assumption that from the Daihatsu is shot, he shoots directly several times on the Daihatsu. The member of the Arrest Team on the other side of the Daihatsu has immediately followed with his gun shot. The series of shots of both AT-ers is directly lethal to both occupants. The conclusion of the prosecution with regard to any criminal proceedings in respect of such events is as follows. The prosecution believes that there are no grounds for prosecution proceedings against the members of the Arrest Team, which in this shooting involved. One who unintentionally fired the first shot, nobody has touched, it can not therefore be accused of manslaughter. In the opinion of the prosecutor, he can rely on the rules of engagement regarding the use of his weapon, and he regards the handling of his weapon is not punishable. The two other members of the Arrest Team, that the fatal shots are fired, acted in the context of the rules of engagement as regards the use of their weapons. Furthermore, the prosecution believes that the two members of the Arrest Team their firearms are used in the understandable assumption that there was necessary defense of their own or another's body against an immediate and unlawful assault by the occupants of the Daihatsu. The prosecution believes that the fine cloud of glass splinters, which the shot was accidental causes, the reasonable conclusion could be drawn that from the Daihatsu was shot. Based on this presumption could actually be made ​​to the use of their firearms. This situation considers OM such that it can be described as (putative) storm or (putative) excessive force. Following this exchange of fire is there a short time later by various members of the Arrest Team shot on the Daihatsu, as I said, the occupants that time, already as a result of the first series of shots deceased. After the final exchange of fire, a member of the Arrest Team with his weapon a pane of the Daihatsu smashed. In addition, some parts of his gun in the car cases, subsequently by a colleague from the car are achieved. This action of the Arrest Team after the first exchange of fire is no crime and there is therefore no reason for a criminal follow-up study . The prosecution considers the members of the Arrest Team is not illegal and the OM is not planning a further criminal investigation. Page created in 10.265 seconds with 19 queries.